U.S. President Donald Trump warned on Tuesday that the United States will be forced to “totally destroy” North Korea unless Pyongyang backs down from its nuclear standoff, mocking North Korean leader Kim Jong-un as a “rocket man” on a suicide mission. In his first appearance at the annual gathering of world leaders, the president used a 41-minute speech to take aim also at Iran’s nuclear ambitions and regional influence, Venezuela’s collapsing democracy and the threat of Islamist extremists. He also criticized the Cuban government. Then turning to Iran, Trump said the 2015 nuclear deal negotiated by his predecessor, Barack Obama, was an “embarrassment” and hinted that he may not recertify the agreement when it comes up for a mid-October deadline. He also called Iran an “economically depleted rogue state” that exports violence. Reading carefully from a script, Trump promised the United States military would soon be the strongest it has ever been. The speech marked his latest attempt to lay out his ‘America First’ vision for a U.S. foreign policy aimed at downgrading global bureaucracies, basing alliances on shared interests, and steering Washington away from nation-building exercises abroad. Trump, who entered the White House eight months ago, told world leaders at the 193-member global body that the U.S. does not seek to impose its will on other nations and will respect other countries’ sovereignty, despite ramping up U.S. military activity in several theatres of war since taking office. The U.S. president also managed to address the ongoing turmoil in Venezuela, calling the situation there “completely unacceptable. Shortly before Trump’s speech, UN Secretary-General Antonio Guterres appealed from the General Assembly lectern for statesmanship to avoid war with North Korea. 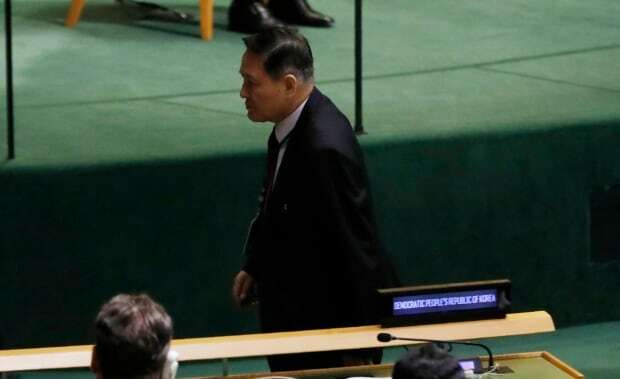 The UN Security Council has unanimously imposed nine rounds of sanctions on North Korea since 2006 and Guterres appealed for the 15-member body to maintain its unity on North Korea.